Nothing makes you feel more inspired and alive than having goals and desires and wishes in living consciously and to know exactly what it is that you really, really want. The more dreams and desires and wishes you have the better. Last week we talked about making a list of at least 101 dreams and desires and then writing them down, so that you might be able to write VICTORY beside each and every one of those. The key is to knock them off one by one. Making a list of your dreams and desires is an awesome start to obtaining the life that you truly want and deserve. Once you start making that list, you are now leaving the port of your old life and setting sail toward your new life and your destiny. Unless you choose your destination first, you are going to be tossed around by the winds in the surf and the waves, and probably never see any sign of the shore. So what I would like you to do is to choose your destination. You do that by prioritizing your goals! So this week our main focus will be on prioritizing your wants and desires so that you can get what you want out of life. The law of self-fulfilling prophecy says that you get what you expect and that you only need to decide which goals or wishes you want to expect to be fulfilled first. This consciousness thinking is required of you in order for you to receive everything on your list. By prioritizing your goals it will supply the needed focus to bring you all that you want and desire, one wish and desire at a time. If you want massive results then you must do massive right thinking, take massive right action right here and right now. Now it’s time to prioritize your desire and wish list. First, write a number beside each goal of one, three, five, or 10 years. After you do that, then prioritize each of your four sections 1, 3, 5 or 10 years. As an example, your goals are to take horseback riding lessons, become a bowling instructor, hire a personal assistant, and remodel your back porch. The first thing that you would do is to decide which of the first two goals are the most important to you. You can use a chart such as the tournament chart, like the NCAA tournament has for March madness, where as the teams win and proceed in a stair step fashion, you will begin to see who will be playing against whom. Your goals and desires are much the same way because you whittle them down until you make a decision for one in favor over the other. Hire a personal assistant is the one you choose! Now, out of those two winners you would choose which one you would like to work on first. Would you like to hire the personal assistant or take horseback riding lessons? And the winner is… Fill in the blank. You just want to simply decide which goal is the most important to you right now. Then you will move to the next round. You want to repeat this process until you end up with the final eight goals, just like in the elite eight for the NCAA tournament, then the final four, and then finally two goals. You should now complete your prioritization chart of which you want to accomplish first, then working backwards to least high-priority goals that you still want to accomplish in this first year of your action plan. The next thing you do is to write two or three concise action steps for your final four. Ask yourself, what are the three highest priority steps that you need to take in order to set this goal into motion. Write them all down. 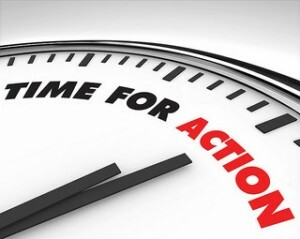 Then you can start with focusing immediately on the highest priority goal and getting into action on that task. 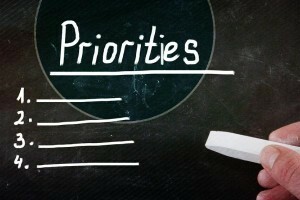 So take the highest priority goal and write it down. Then decide to focus on and direct all of your attention to one goal at a time, because you can only achieve one at a time. Remember, Life isn't about finding yourself, Life is about creating yourself. Time to create the best life possible!